The defender was one of Germany’s star players at this summers World Cup. Borussia Dortmund defender Mats Hummels has pledged see out the remainder of his contract with the Bundesliga giants and will not seek to move away from Signal Iduna Park. Manchester United Cristiano Ronaldo – Check out the latest rumours regarding the Red Devils next transfer target. SEE ALSO : Top 100 Sexiest Football WAGs In The World 2014. The Germany international had been linked with moves to both Manchester United and FC Barcelona this summer with the Red Devils having a £20m bid rejected by Dortmund. Despite all of the interest in his signature, the 25-year-old remains committed to staying with the German side and is adamant that his contact, which has no release clause in it, will be seen out until it expires in 2017. 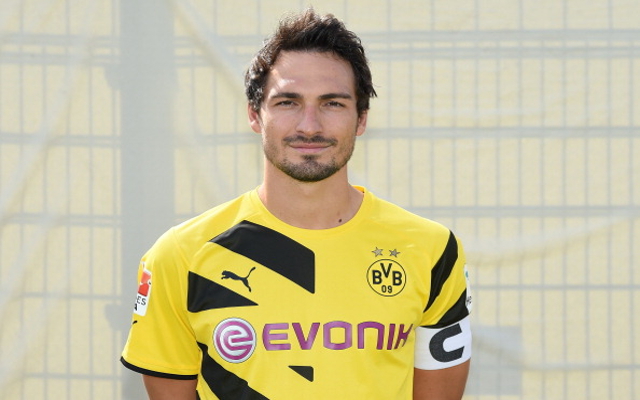 “I wanted to set an example with the extension I signed and it will run for five years until 2017,” Hummels was quoted by the Daily Express. The highly rated centre back also revealed that he could have stayed at old club Bayern Munich had they treated him better. “If Bayern had not bought Breno in 2007 for €12million [£9.6m], I would not have left, but that’s the way football is sometimes,” Hummels added. Hummels enhanced his reputation during the 2014 World Cup by being a strong, powerful presence at the heart of Germany’s winning defence.